At WreckMonster, our Car wreckers Baulkham Hills 2153 crew has made vehicle scrapping easier for entire North-West Sydney region, New South Wales. If you have got an old, junk, or unwanted vehicle that is taking up space in your driveway, you will agree that this isn’t a best situation to be in. Especially if you are unable to get rid of it. And seeing as junk cars are impossible to sell, this isn’t your fault. But here is a solution to your problem, and it does not involve abandoning it or dumping it in a landfill. Just give us a call and turn your old junk into fast cash today. We can easily remove that eyesore from your place regardless of whether it is dead or alive (running or not running). All the running vehicles would be picked up for no extra charge and non-running automobiles will be removed. As a premier Sydney Auto Wreckers, we buy all make, models and brands along with this we also provide free pickup facilities. We pay top dollar for all types of Vehicles. Selling your car via other methods is a notoriously risky venture, as you might not get the full amount that your vehicle is worth. This is due to people trying to drive the price down via negotiating. At Wreck Monster, we pay highest cash up to $9,999 for all kinds of automobiles. Our experts will take the make, model, age and condition of your car and make an estimate that will be generous and accurate. Just give us a call and sell your vehicle as is. Cars are the most familiar type of vehicle on the road, but we pay cash for Utes, Vans, SUVs, 4WD and Trucks as well. As we are the leading cash for cars business in Baulkham hills, and we have a huge network of auto buyers. We ensure to provide timely removals and trustworthy services. When you trade with us, you don’t have to worry about the paperwork. We provide all the paperwork on time without causing you any inconvenience. The main reason why we take on these responsibilities is so that the whole selling experience is as convenient as possible. No matter where you are located in Baulkham Hills, get in touch with us today to book a free car removal. Call us at – 0478 682 103 or you can fill up with our easy form on our website and get an instant quote. Once agreed, our expert towing experts will tow away your vehicle as soon as possible after we pay you cash on the spot. If you are concerned that we will charge you for the removal process, fear not. The truth is that we will not charge you a dime for the removal service, making it completely free. Other companies will attempt to make you pay for the removal of your car. However, we believe that you deserve the full value of your car, so we won’t make you use some of the money we just paid you for the purpose of auto removal. It is perfectly normal to have to make repairs on a vehicle from time to time. Sometimes you need to get a replacement part in order to do so. However, it is recommended that you don’t buy your part brand new. This is because second hand parts are often just as good as brand new parts. Plus, they are much more affordable. If you are looking for quality auto spare parts at reasonable prices, contact us today at our above number. We provide high standard used parts for all makes, models and brands. All of our auto spare parts are fully tested and guaranteed. If you are on a lookout for a particular auto part, visit our scrap yard today and one of our expert staff members will be happy to assist you. Is your vehicle too old? No problem. We will buy it off you no matter how old it is. It also doesn’t matter what condition it is in either. Even if it is totally unrecognisable due to extreme misfortune, such as flood, fire or accident. We buy junk cars of all makes, models and in all conditions, which includes Mazda, Daewoo, Daihatsu, Isuzu, Suzuki, Volkswagen, Subaru, Nissan, Toyota, SsangYong, KIA, Ford, Holden, Hyundai, Honda, Skoda and Peugeot. Even if your vehicle is immobile, feel free to contact us. We will remove it in no time leaving you behind with the highest cash in your pocket. As we are environment lovers, we use green ways while recycling, reusing and reselling automobiles. Vehicle Dismantlers at Car Wreckers Baulkham Hills are fully licensed and knowledgeable. They love what they do. And the fact that they are only helping the environment adds to the job satisfaction they get at the end of the day. After removing your vehicle, we take it to our dismantling yard. Where we dismantle it to remove its usable parts and recycle, reuse and resell them. After this the scrap metal is crushed and sold after recycling for good value. Due to this we are able to pay stack of cash for even trash wheels. Still wondering where to scrap my car in Baulkham Hills Area? Getting a quote from us is easy. Contact us today. We have a quote request form on our website to fill out. Or give us a call at –0478 682 103 and get an instant auto valuation for free. Just make sure you tell us the make model and condition of your vehicle. 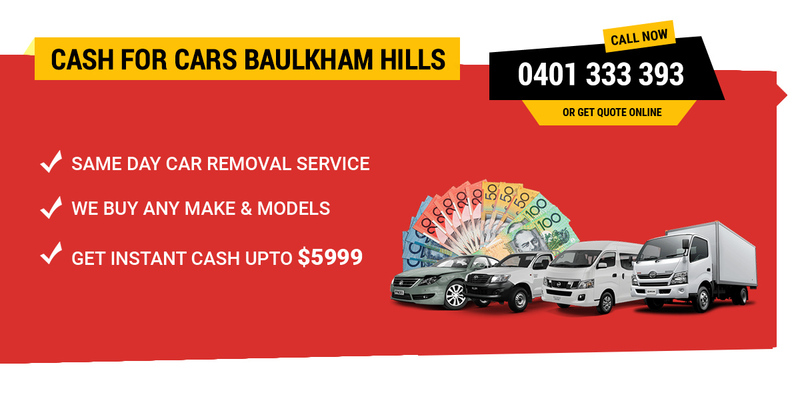 Our Car wreckers Baulkham Hills 2153 experts will get back to your with the value of your car in no time.